It's exciting to buy a new computer. As soon as you haul the laptop home from the store, or the delivery truck drops off the extra-large box, you just want to tear into your new machine and see what it's capable of. If you want to have a better experience, however, you'll stop, take a few deep breaths, and do a little preparatory work first. Taking a bit of time to set up your new PC can make a world of difference in its performance, its long-term stability, and your personal sanity. Besides, your old PC almost certainly has some data on it that you'll want to move to the new one, and that's a task best not delayed. 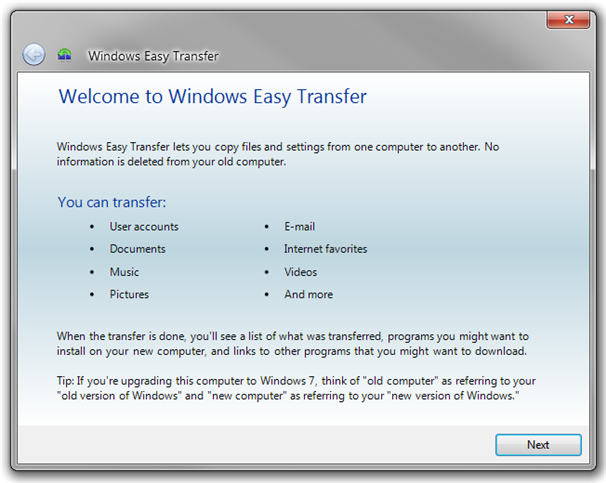 You can use Windows Easy Transfer to copy your data, but it might not get everything you want. You can find tools to automate this process somewhat. Microsoft's built-in Windows Easy Transfer tool does a good enough job but doesn't necessarily transfer everything you want; other third-party tools are similar. These aren't bad choices for moving data and settings from an old PC to a new one, but I don't like them for two reasons: First, if the data is that important, you should be backing it up, not just switching it from one point of failure to another. Second, none of these tools really grab everything you want them to get, so you end up manually transferring stuff anyway. Here's a better solution: Buy a cheap external USB hard drive if you don't already have one. You can burn your data to a bunch of DVDs if you prefer, but that's kind of a hassle. Plug in the USB hard drive, name a folder 'Old PC Backup' or something similar, and start copying files and folders there. 1. Back up your music, photos, and videos. Personal photos and videos can never be replaced--those are your most precious megabytes. 2. Next, turn to your documents. If you have been saving everything to the My Documents folder in your user directory, your job is easy. Otherwise, you'll have to hunt around in Windows Explorer and the Desktop to find every important document and copy it to the external hard drive. 3. Fire up your Web browser and go to its bookmarks manager, and then export your bookmarks and copy that file to the external drive--assuming that you aren't using Xmarks or another bookmark-sync tool. This is a great time to clean out old, unused bookmarks, too. 4. Launch whatever software you have with activation limits and deactivate or deauthorize your old computer. Photoshop and iTunes come to mind. 5. Before you disconnect the external drive and power down the old system for good, consider what other data you might want to keep. Your game saves, for example. When you're absolutely sure that you have backed up all the useful data to the external drive, you can shut down your old computer forever. Copying files to an external drive and then to the new computer might seem like a slow, tedious, pitifully manual way of getting data to your new PC--but it has the benefit of providing a nice backup of all that important data, ready to restore should your PC ever suffer a catastrophic failure, go missing, or get stolen. 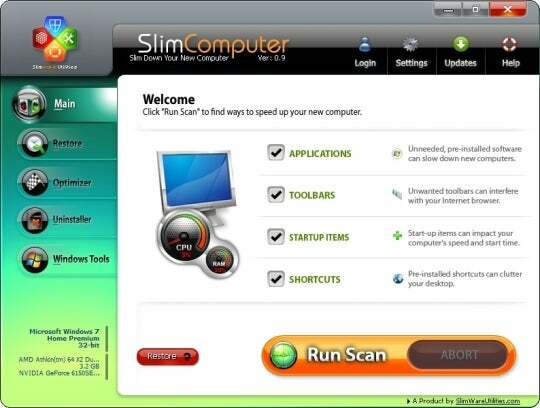 SlimComputer can automatically remove your new PC's included bloatware. Unfortunately, computer manufacturers still insist on shipping new PCs loaded down with a lot of software you may not want or need. Some of it is just annoying, while other programs can slow down performance. There's no one way to know exactly what you should remove and what you shouldn't. Start by going to Control Panel, Programs, and then clicking Uninstall a Program. Scroll down the list, and remove any software you know you don't want: image viewers, media players, antivirus software you don't like (though you should replace it with something else promptly), toolbars, software trials ... just use your best judgement. If you're unsure about a program, write down its name and revisit it later. Many PCs come with software to update the drivers and utilities; I recommend leaving this kind of software on your system, though you may want to tweak its options to check for updates less often if you find it bothersome. Keeping drivers and other software up-to-date is an important part of keeping your PC running well. You can find some tools that will help automate this process. A nice bit of freeware called SlimComputer will scan your PC and make suggestions for what is safe to uninstall or remove from your PC's startup, and it can do the zapping in a few clicks. A simpler and more straightforward app is PC Decrapifier; on the creator's Website, you can see a list of the programs that it can automatically remove. If your PC came with a tool to search for driver updates and other important software (and you didn't just delete it), run it now. If such a tool isn't installed, head to your PC manufacturer's Website and look in the support section for your model. You'd think a brand-new computer would come loaded with all the latest drivers, BIOS updates, and other important system software, but that isn't always the case. Keeping these items current can improve your PC's performance and reliability, so don't skip this important step just because everything seems to be working well. The support section of your PC maker's Website will usually have the most recent drivers and utilities, but graphics drivers are often outdated. If you have an Nvidia graphics processor in your new system, head to Nvidia's Website to download the latest drivers. For AMD/ATI graphics, head to the AMD support site. This is a good time to perform a handful of useful Windows tweaks. If you want to adjust how often you receive annoying User Account Control alerts (the security pop-ups that make you acknowledge when an application is trying to do something), head to Control Panel, User Accounts, and click Change User Account Control Settings. I suggest you don't disable it completely, though. A huge pet peeve of mine is Microsoft's insistence on hiding file extensions by default, as if our feeble brains wouldn't know what to do if we saw the .jpg, .doc, or .mp3 at the end of a file name. To fix this setting, launch the Explorer file browser (not Internet Explorer), click the Organize drop-down in the upper left, and choose Folder and search options. Go to the View tab and uncheck the box that says Hide extensions for known file types. While you're in there, you can make other tweaks to the way Explorer displays files and folders. You've backed up your old PC's important data, cleaned the junk from your new PC, updated drivers and other system software--it's finally time to get to the good stuff. Now you can fill up your new PC with new software. For this task, there's no tool I like better than Ninite. You can use Ninite to install dozens of useful apps with a few clicks--no unwanted toolbars included. Ninite is a Website that lets you install a load of useful free software all at once, no user intervention required. Simply head to the site and check the boxes next to the software you wish to install. My list would include Chrome, Dropbox, Evernote, Firefox, Flash, iTunes, K-Lite Codecs, Microsoft Security Essentials, Silverlight, Skype, Steam, uTorrent, VLC, .Net, and 7-Zip. Just click the Get Installer button, and the site sends you a tiny executable file that, when you run it, will download all of the selected applications from their original sources and install them with default settings, all at once, with no user intervention required. It doesn't install toolbars and other extra junk that can sometimes tag along with free applications, and it's smart enough to grab the 64-bit versions if you have a 64-bit operating system. Sure, you'll have to tweak some of the defaults and maybe dump a few unwanted desktop icons, but it's still an enormous timesaver. You're not done yet, though. Ninite is great, but it may not have all the software you need. If you like using a certain app that wasn't available on Ninite's list, or if you have for-pay software (such as Microsoft Office, Photoshop, or games), now is the time to install them. For example, I would install the handful of games I'm currently playing, plus TweetDeck, Windows Live Photo Gallery, and several choice browser extensions. Now that your new computer is up-to-date, free of junk, and loaded with the tools and applications you want, it's time to go back to the external hard drive and start transferring your older data. Copy everything from the backup folder to your new computer (don't move the files, copy them, so that a backup copy remains on the external drive). This is an opportunity to get organized, as well, so take your time and carefully place your music, photos, videos, documents, and other important data in subfolders that make finding everything easy. The whole process of prepping your new computer, even with timesaving tools such as PC Decrapifier and Ninite, can take a few hours. Forcing yourself through a few hours of boring busywork when what you really want to do is play around with your shiny new PC can be tough. Nevertheless, I encourage you to be patient and to follow these steps--tolerating a few hours of boredom when you first obtain a new PC can save you from dealing with lots of headaches in the future.